Nike's New $1,200 Sunglasses Are Really—Wait, $1,200? For top runners, like the elite specimens competing in the Olympics, every last thing you wear needs to be engineered for comfort and speed. So Nike and Zeiss took inspiration from human anatomy for a new pair of sunglasses that wrap around an athlete’s head. 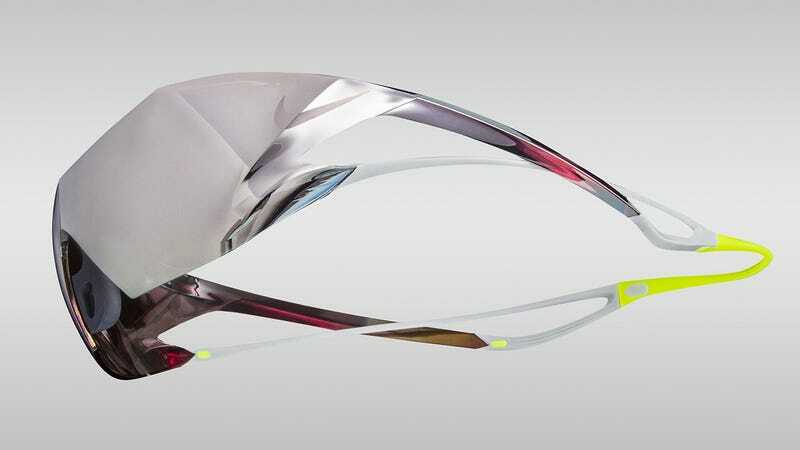 The Wing, which Nike refers to as “sun shades” instead of sunglasses so they sound cooler, feature a lightweight but reinforced frame which is apparently inspired by the tendons in your arms and legs. To help reduce stress and fatigue on specific parts of a runner’s head, the Wing features an over-sized sun shield that extends past the temples and transitions into a wraparound silicone strap that helps to evenly distribute its weight. Or what little weight there is since at just 26 grams you’ll barely feel the Wing on your face. Other absurdly over-engineered features include a flexible silicone nosepiece, and ventilation to help keep an athlete’s brow cool and dry while reducing fogging. Oh, and a $1,200 price tag. Yep, if there was any doubt these shades weren’t designed as merely a fashion accessory just peep that price tag. Thank God for corporate sponsors.